Beattie Animal Hospital is starting a senior awareness program – expressing the importance of specialized care for senior pets! If your pet has been seen within a year, then a brief exam / quick consult with you can be done along with bloodwork. This exam is free of charge (as long as there are no concerns at the time of appointment)! 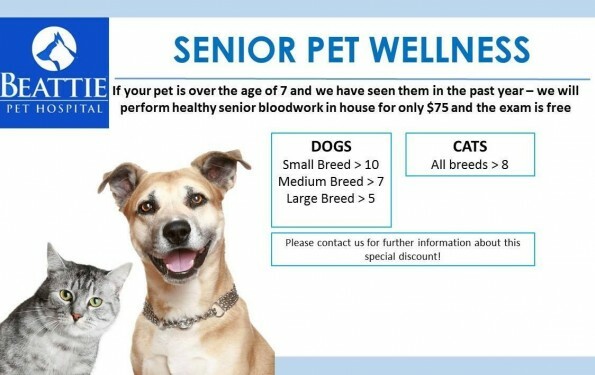 The intention of the senior awareness program is to educate our clients on the responsibility of owning a senior pet. Our goal is that this will help to rule out any preventable issues by completing appropriate screening.